"I appreciate being informed about the shipping date. That is very helpful . I can get in anticipation mode. The pens will be enjoyed. 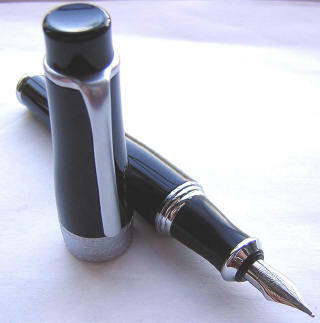 When I select a pen for writing a letter, I know that the pen will be the correct one. 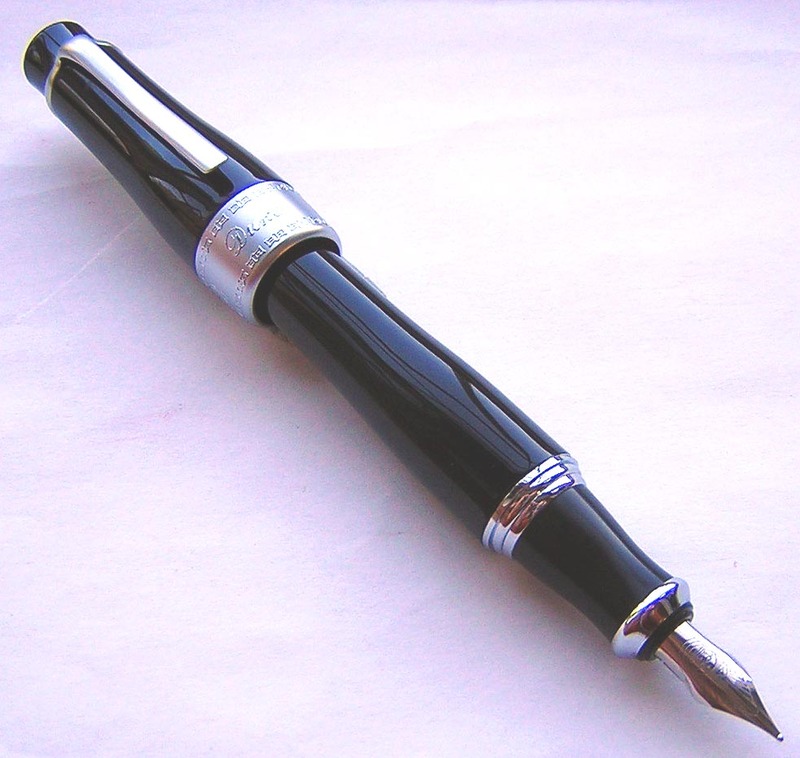 Your pens are always ready for writing...Your website has so much for FP collectors that I am pleased to add my experiences and delight with this excellent source...I am so lucky to have found your site. 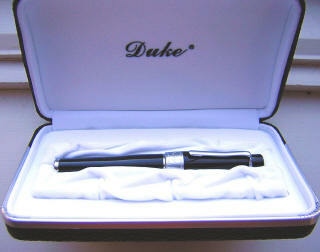 Thankful,"
"...the Duke 'Niner (nee Charlie Chaplin) arrived today and all I can say is OMG! I feel like one of my many nieces when their hair does exactly what they want it to. This thing is so bitching, Norm...And I must say that your "tune-up" has revealed to this poor scribe what a FP is actually supposed to write like. I thought my Sheaffer was all that and a bag o' chips, but the 'Niner beats it hands down. I don't know what you did, but Norm you've got to tell me, because I've got a dozen FPs that don't work quite right and I must get them working at least in the neighborhood of this one." 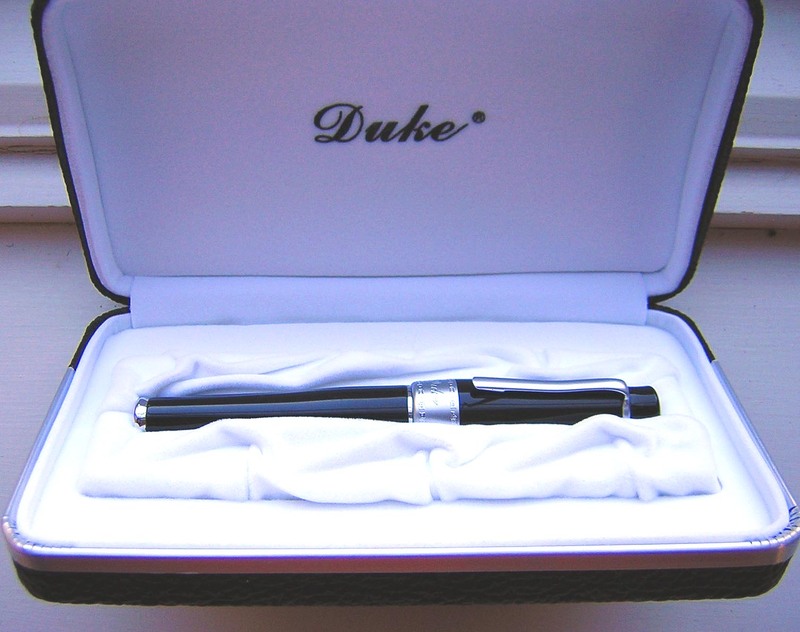 Here we have a pen design that's a very different one for DUKE, or for any other manufacturer for that matter. Visually, the first thing that strikes you is the bulbous midsection, quite unlike any other design that comes to mind. The second surprise is the heft of the pen when you first pick it up. 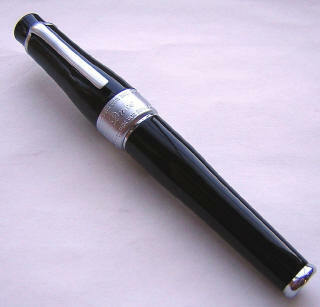 Although not an oversized pen by today's standards, it is a large pen, measuring 5-1/8" capped but a full 5-7/8" posted. 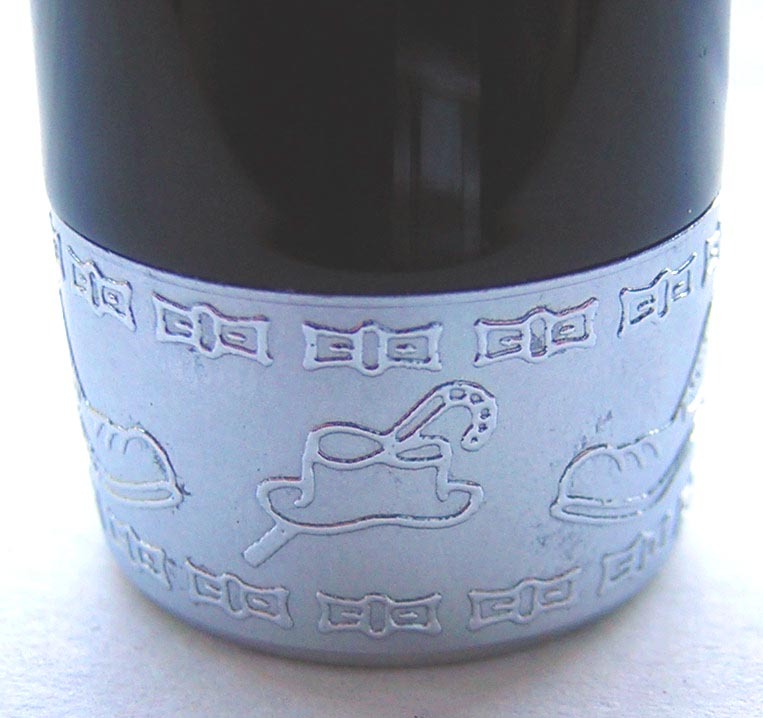 The heft comes from the lacquer-over-brass construction, along with the extra girth just above the cap band (3/4" in diameter). However, I found the pen to very well balanced, whether using it uncapped or posted, and to my hand at least, extremely comfortable to write with, with my thumb and index finger resting on the narrowed section above the nib. The clip and cap band are rendered in a very attractive matte finish, which is very nicely highlighted by the more polished and reflective barrel-end and clutch ring. Surprisingly, this doesn't clash, but rather creates a very subtle counterpoint. Both ends of the pen are concave -- black lacquer atop the cap and a silver end-piece on the barrel bottom. It's the large center cap band that really rivets the eye however, as the raised metalwork tells the whole story. Directly beneath the end of the clip, 'Duke' is rendered in a flowing Copperplate script. 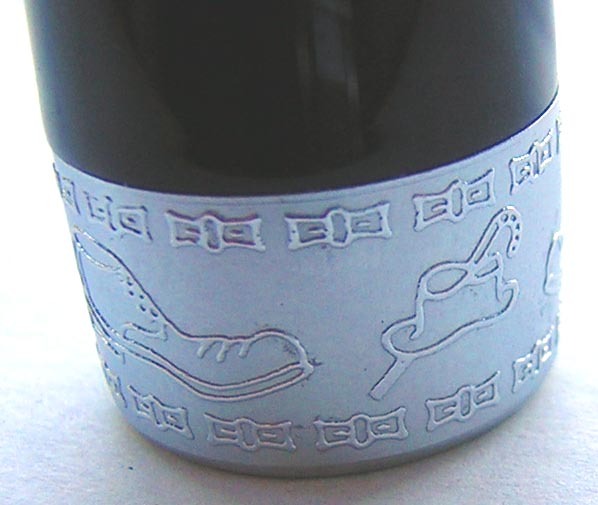 Rotating the cap reveals first an iconic 'tramp's shoe', followed by a cane and hat, and then another shoe. 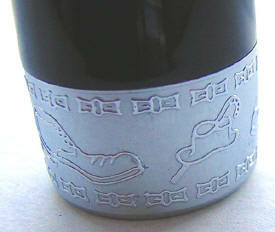 The entire circumference is banded, top and bottom, by what I believe to be bowties! Removing the cap (which clicks securely back in place) reveals the beautifully scalloped, 22K gold-plated light-medium nib. 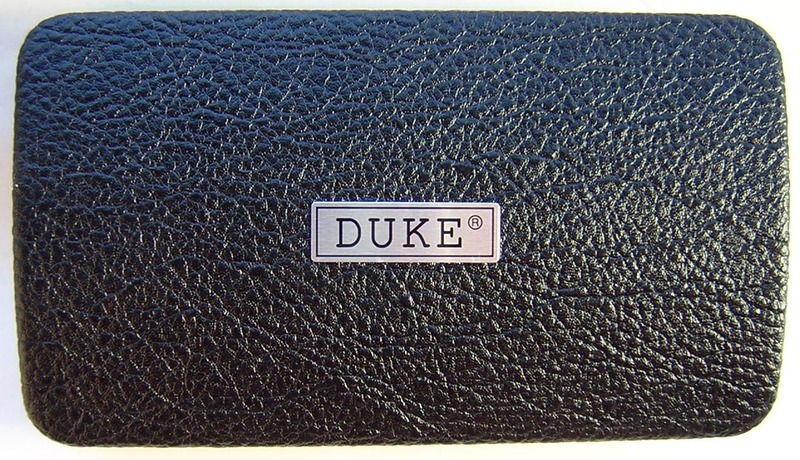 The DUKE 'crown' logo is used to great effect, and it produces a stunning appearance. 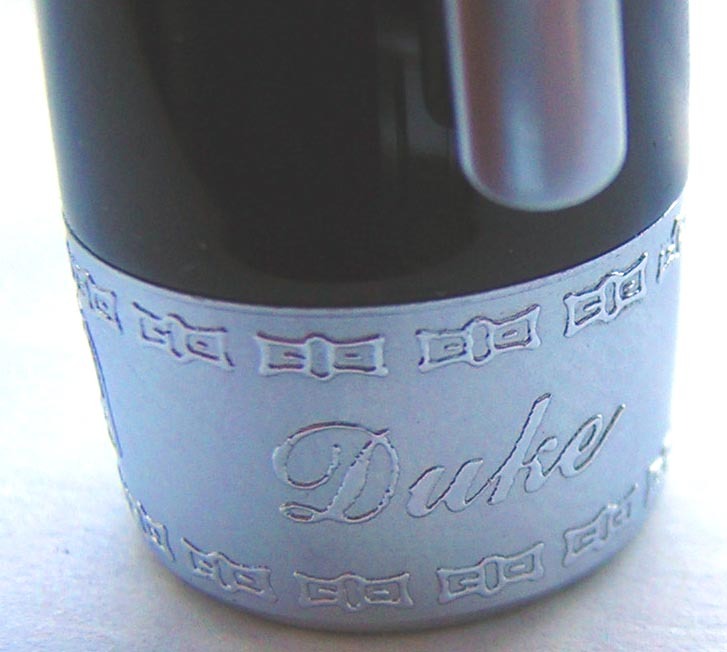 Unscrewing the all-metal fittings between the barrel and section presents the piston converter for bottled ink, which is nicely chromed and engraved with 'Duke' and 'Germany'. 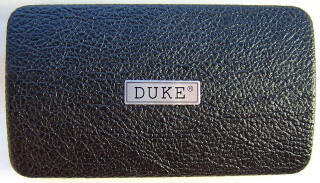 The pen comes packaged in an attractive, black leatherette pen box.